The winds of change are blowing upon Fireach Speur. 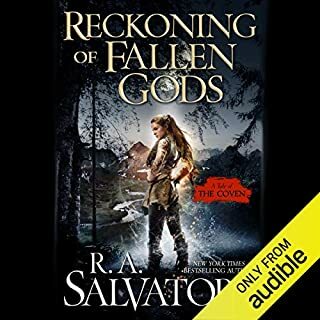 Aoelyn risked her life to save the trader Talmadge, and it cost her everything that is dear to her, but Talmadge survived and can’t forget the amazing woman that killed a god. Little do they realize, war is coming to the mountain. Far to the west, a fallen empire stirs. One that sees a solar eclipse as a call to war. Their empire once dominated the known world, and they want it back. For countless millennia, no man or beast has ever succeeded in breaching the stone gateway into Girdlegard. Until now.... Abandoned as a child, Tungdil the blacksmith is the only dwarf in a kingdom of men. But when he is sent out into the world to deliver a message and reacquaint himself with his people, the young foundling finds himself thrust into a battle for which he has not been trained. Drizzt is back, and facing a world changed forever! An uneasy peace between the dwarves of Mithral Hall and the orcs of the newly established Kingdom of Many-Arrows can't last long. The orc tribes united under Obould begin to fight each other, and Bruenor is determined to finish the war that nearly killed him and almost destroyed everything he's worked to build. But it will take more than swords and axes to bring a lasting peace to the Spine of the World. Powerful individuals on both sides may have to change the way they see each other. They may have to start to talk. And it won't be easy. 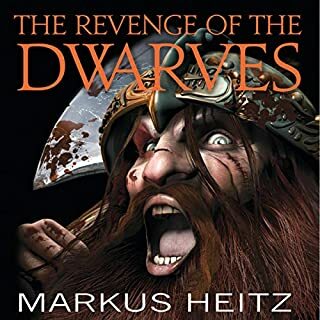 This book wasn't just the next installment in the long-running saga of the famous dark elf, but the beginning of a bold new trilogy that will help change the face of the Forgotten Realms world forever. Don't forget to listen to more adventures of the Forgotten Realms. 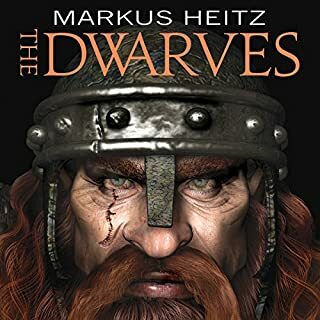 Don’t have much to say about the story; like other entries in the Drizzt series it’s nothing that will blow you away, but is a solid enjoyable outing nonetheless. It is (or at least this version) however hampered by the narrator. 1) the change from Victor Bevine who has narrated up to this point is an abrupt one and is distracting, most notably because they don’t use the same voices for the characters (which in fairness isn’t much of a surprise as it’d require a very skilled voice artist to replicate the voices of another). Now everyone is entitled to their own take on the characters, but the effect is like if in say season 4 of a tv series every single character was recast, which would break emersion; and as it looks like Bevine is back for the next arc in the series, to extend the analogy it’d be as if all the original cast was brought back in season 5. 2) early on Bramhall sounds a bit bored, or as if he’s phoning it in. As things go on he gets a bit more lively and into the role, so hopefully this problem won’t be present in the next book in this trilogy. 3) he over enunciates some words. Regular words in the English language he’s okay with, but various names and the like he puts a lot more stress on than needed; the best analogy I can think of is like in a dub of an anime where the voice artists speak normally when speaking English, but put on a strong Japanese accent for the odd word of Japanese (such as names) that’s still present which sounds abrupt and forced. 4) inconsistent pronunciation. This is partly a mix of 1 and 3 as some words he pronounces differently from Bevine. Again, this isn’t an issue with regular English words but with fictional names/words (eg Menzoberranzan). A handful he’s even inconsistent with himself (eg ‘Wulfgar’ is pronounced as ‘Wolf-gar’ half the time and as ‘Woof-gar’ the other half). 5) some times when he uses the letter ‘s’ it sounds as if he’s spitting all over the script. I’m unsure if he has a slight lisp or if it’s an issue with the recording equipment, but either way it can be distracting some times. Overall he’s not a bad narrator, but all these issues together snowball to detract from the performance. 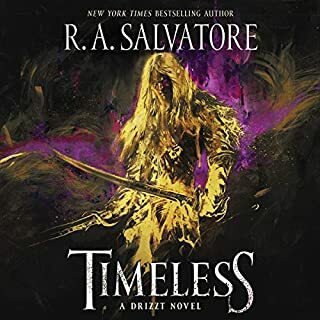 If this was the only Drizzt book I’d listened to/planned on listening to I’d probably have rated the performance higher and if he was narrating a stand alone book or a different series from the beginning they wouldn’t stop me from listening. 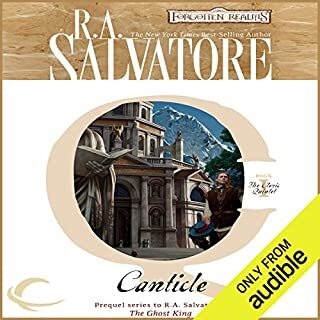 Overall I’d rate this audiobook a 3-3.5 out of 5 and I’d probably bump it to a 3.5-4 if it were to be re-recorded with Bevine for sake of consistency. Didn't recognise some of the characters due to changed pronunciation. Very distracting. Spoilt the book. I’ve worked my way through the entire Drizt series, really enjoyed most of it, but am truly disappointed that I no longer recognise the characters by the reading. I am probably going to skip the rest of the series. Hey ho! Gave story 1 star because the narration is so distracting. these books, great characters, impossible battles, whatever happened to Victor Bevine though? No offence to Mark but he shoulda listened to the precedin' books. What did you like best about The Orc King? What did you like least? The narrator's voice sounds like it is putting his face to sleep. The pronunciation of his words may be a little more true to how they should be pronounced but sound so off-putting and gross. Who picked this guy as a narrator, he is like a human text book! Boring and technical. Get a computer to read the book, it would beat this narrator and his monotonous drone. 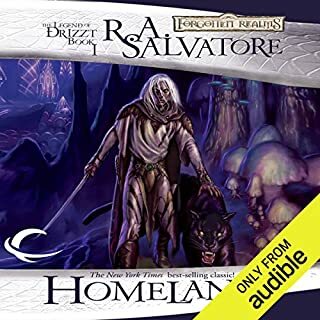 After listening to the audio book for a short time I was not worried about having not read other novels in the Drizzt series before. 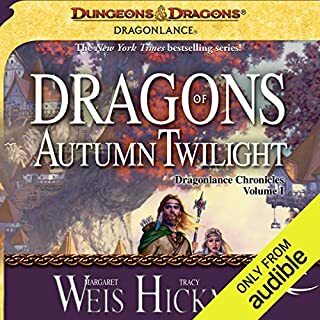 The narration was a welcoming sound and I enjoyed being led into the adventure of Drizzt and his adventuring companions with fluid verse. Dungeons and Dragons is a game which you might have heard of, and a huge part of the game is story-telling. This lends itself well to a rich universe for the creators of D&D to make some extremely entertaining characters and novels based on those characters and adventures. If you like high fantasy, then the Dungeons & Dragons multi-universe is going to be your cup of tea. Characters evolve, and so do the lands they live. Drizzt Do'Urdens' adventures are a great place to start. He is a contemporary character with several recent novels being released. You can expect many great adventures, for a lawfully aligned Drow, he sure lives a long time, and that's a lot of room for stories. 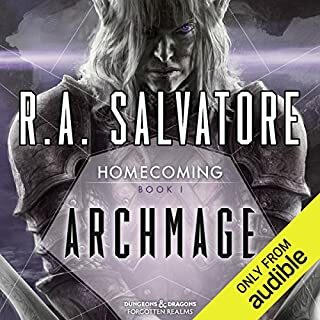 R.A Salvatore is a good writer, he fleshes out description and pushes the tale along, so you don't feel you are being told what just happened. I play quite a lot of Dungeons & Dragons, and I'm also a local Dungeon Master for official events on the Isle of Wight. 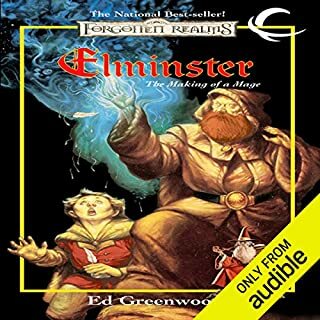 I love rolling dice, and now thanks to audible can listen to novels while at my regular job. At first I was like where the hell is Victor!? At first I went on a right rant to everyone I knew wondering why audible would change the author. After the first chapter I got use to Mark Bramhall and I believe his narration to be amazing. Great story with some very memorable characters. At first the speaker is clearly putting far to much emphasis on his pronunciations. But a few chapters in he settled into a more listenable rhythm. 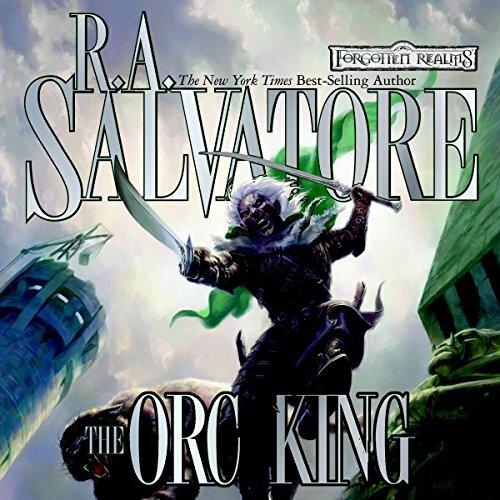 Would you consider the audio edition of The Orc King to be better than the print version? 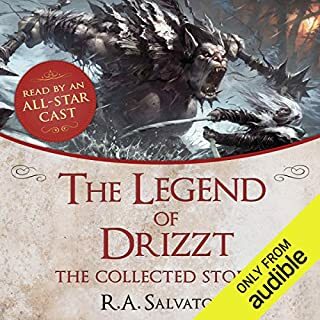 So if you've been listening to all of these Drizzt books be prepared for a new narrator. He changes the pronunciation of every name. I get he wants to put a flare of his own scent on this but seriously... Luskin is pretty dang basic yet he calls it Louskon. I almost didn't continue the story at first because of this. Yes, if you are a fan of R.A. Salvitore novels you will want to hear this story. It is a good story, although I think some of his other books are slightly superior. What didn’t you like about Mark Bramhall’s performance? Bad. Granted I've grown used to Victor Bevine's narration, but Mark Bramhall was just bad. Not only did he mispronounce "made up" words like Bruenor and Drizzt, but he also badly mispronounced some of the standard English language. I can only presume that other narrators were unavailable, or that Mark Bramhall was extremely inexpensive. No, the story was good, but the constant narration errors were grating. Needs to be re recorded with Victor Bevine! Awesome book, but needs to be re recorded with the voice of Victor Bevine. Mark Bramhall does not have the same rhythm, finesse, and grasp of character that Victor does. After listening to Victors previous 16 performances in this amazing series, I was devastated that they decided to change actors for these three books. BRING BACK VICTOR!! Very disappointed with the performance on this one. I understand that things are going to change when a new person is reading... but this just shows a great lack of effort. After spending hundreds of hours listening to this series I was appalled that the Bramhall, or someone in charge of production, couldn't take the time to at least maintain the previous pronunciations of the characters' names. The reading is flat, almost as though Bramhall is reading through a list and not a story. Horrid Narration. Read it instead. Story is great. It continues the adventure. 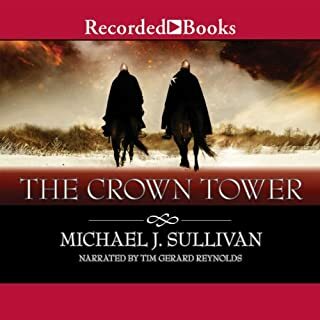 But the narration makes me want to ask for my credits back or have audible send me the books so i can read them my self. Drizzt for obvious reason but again how could you even let this go out with such bad narration. Who would you have cast as narrator instead of Mark Bramhall? Victor Bevine. Hands down the best choice for this. Was The Orc King worth the listening time? I could not even finish listening to part one let alone the whole book. The voice is dry and the narrator reads it as if reading the news or pronouncing one word at a time. If would like to get a refund of my credit or the physical books so i can read them. This stop the story for me right in the middle of the series. What did you love best about The Orc King? Narrator mis-pronounces most of the key names, and has downright dreadful voices for the characters. Why was the narrator changed? Please bring back Victor Bevine. What would have made The Orc King better? Have Victor Bovine read it! 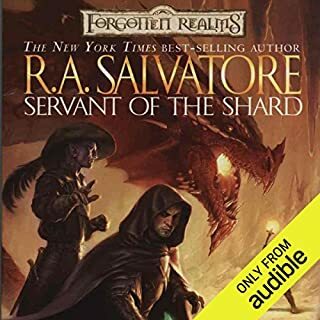 Would you ever listen to anything by R. A. Salvatore again? Yes, I like his style of writing. Victor Bovine! Mark is horrid. His pronunciation is terrible, little to no change in tone regardless of what is happening, almost no difference between male and female characters. He ruined this series of books. What character would you cut from The Orc King? I wish I had listened to the sample of this narrators voice. He ruined this entire series! Let the man Victor Bovine read these books. If I had it to do again I would have bought the kindle version of these books and read them by hand like a caveman. Seriously disappointed. What made the experience of listening to The Orc King the most enjoyable? This is not a good place to get into the Drizzt Do'Urden series... it really is foolish to jump into the series here without reading the earlier novels. The author already assumes you know a lot about the characters at this point. Start with earlier books in the series both for the sake of the story and characters, and also to hear Victor Bevine give a narration that will make you fall in love with these beautifully written stories. Victor Bevine has been doing a great job on the other books in the Legend of Drizzt. Mark's portrayal of Drizzt makes him sound bitter and angry as at least one other reviewer has noted. Mark also pronounces some of the names of the characters in ways that vary so greatly from Victor's that it is confusing. Mark reads this series like an instruction manual. His voice never changes tone. He adds his own commas, breaks, pauses and periods. The only reason I didn't fall asleep listening to him is because of the voice changes between characters. Drizzt always sounds pissed off. The Orcs sound human. The dwarves sound like a bunch of drunk Irish or Scotts. His pronunciation is extremely horrible. He changed Bruenor's name from 2 syllables to 3. Luskin is pronounced Lou Skin etc.... Did he even listen to Victor's previous readings? You don't come in the middle of a series like this and start making up your own pronunciations. Readers/Listeners are looking for continuity, especially after hearing Victor for so many books. I wasn't even remotely able to enjoy this book because the only thing I could think about was how excruciating Mark's voice was while he was murdering the read! I'm extremely disappointed in Audible and whoever is responsible for hiring the readers. You charge 3 times what the book costs to buy and you pick someone like Mark? Why didn't you quality check your own product? If you did quality check it, fire that person because he/she doesn't know how to do their job. You shamed yourselves, your listeners and R.A. Salvatore.